Discussion in 'Completed Pin Sales' started by Wolfcryrain, Nov 2, 2018. 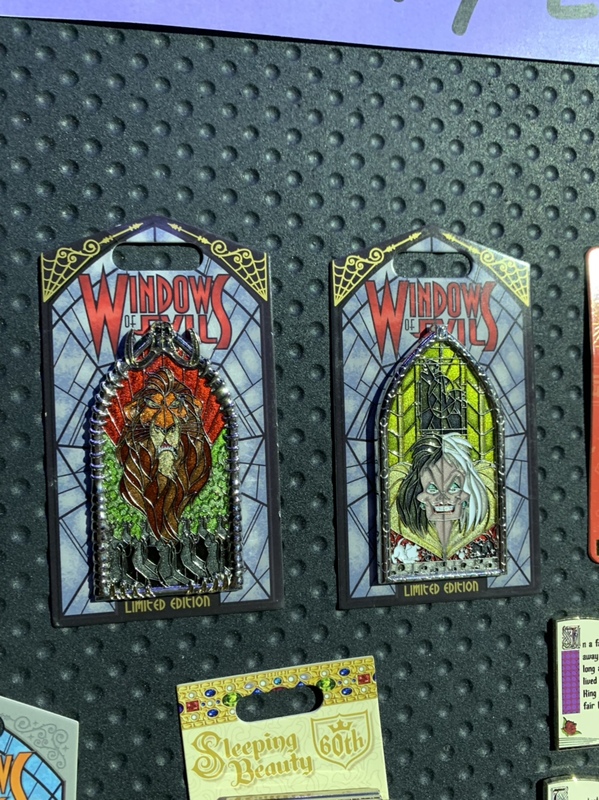 Would anyone be willing to pick up the two Windows of Evil coming out this month for me? Also does anyone have the ones from the previous months they might sale? I'm sure someone would offer, if they could. Unfortunately this is one of those CRAZY releases that no one knows if they'll get any, much less extras. Locals were hoping for a surprise release, but since Disney has decided on announcing it, sounds like they're going for insane (If it's anything like the last oogie release, it sold out resort wide within an hour of park opening and that's while you're in line). For those hoping for Windows, I'm sure you'll see a bunch on auction sites, after all it's an LE2000, just be patient and wait cause as we know the prices will go down. Good luck everyone, I'm sure there'll be feedback on how the morning goes on the forum. Kerri780 and Shelterkat like this. Since it's been awhile , 5/6 mos, since last release, It's laughable now, because as I retell it, sounds absurd that I'm not in a ride line, but I've heard it's just as bad for Funko or the Tiki mug collectors! krand1276 and Wolfcryrain like this. After being told DTD PT wouldn't open till 9, tried the hotels which apparently weren't selling any, ended up waiting for the parks. Considering it was poor weather enough pin traders showed up to sellout the pins within a couple hours from opening. Found out DTD PT opened at 7 due to the rain, and so did DLR Emporium. 20th Century Music had 5 registers going. So it looked like DLR was prepared for the release. Both parks opened at 9. Congrats to All that were able to get them!! Now to see if the new designs hold to complete the set. Looks like the final 2 will be released in January. TheMickeyMouseRules, Ajk, ItzaPinfan and 1 other person like this. Thanks for the lowdown...they look gorgeous and I’m not much of a villain fan but dang they are nice. I’ll be there for the Horn King Release for practice...so you recommend park line up that opens at 9 rather than DTD PT which opens earlier at 7? Or did DTD just open early this time because of rain? This was hard to figure out, due to the rain. It wasn't as chaotic as Oogie, but since it still sold out quickly, if the weather is nice I'm guessing be prepared for anything. You definitely have more options at DLR for stores, than DTD. Usually those w/o valid passports will pu at DTD stores, and the quantity is mostly inside either park. Being your 1st time, it'll be more of an experience, that's unpredictable. Even regulars are never sure what to expect, till we're there, never a guarantee of anything, due to the infamous Disney clause to protect them for ANY CHANGES! Wish you luck, I'm sure you should be fine for 2, it's if you're trying for more that's tricky. I thought the last of the WOE pins were coming out in December. Which ones are coming out in January? 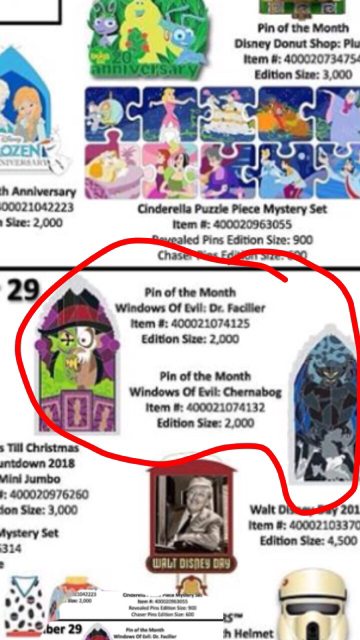 Seems like it'll be Scar and Cruella, in December we're 2 short, and checking pic in 2019 pin release discussions, there's a pic of them with the new Windows of Magic. Ajk and stitchismyspiritanimal like this. Yep, I remember that now. Any opinion on the new group of windows? Here’s the pic I took. Are these the last two? @Wolfcryrain, did you gain your pins?